Designed by our team to meet the needs of everyone that likes to sit fully supported, whether that’s in bed or in your favourite chair. The prominent feature which makes this product unique is the extended arms. Wrap these around you and not only do you feel embraced but they support your arms. This is critical, as when you read, your shoulders won’t ache and you can spend more time relaxing and enjoying your favourite book. This product is also popular for women with newborn babies, as the cross over arms will support and cradle your baby whilst feeding. This pillow is amazing. I am currently 7 months pregnant and feeling uncomfortable in bed, this helps so much. I had considered a pregnancy pillow but decided on this one with nursing in mind to use after my baby is born. I’m so glad I chose this one. 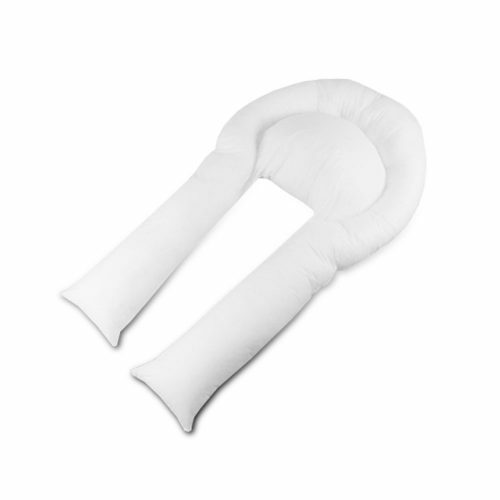 I had a pregnancy pillow for my last pregnancy and found it fiddly as I would have to move it around during the night to change position. I am 5 foot 7 and with my head at the top the sides are down just below my knees so I can easily turn either side and pull one of the sides between my knees for support with the other side supporting my back or laying flat on my back with extra support on my back. I really love it. It’s great for lounging on the couch too so it will be definitely used well after my pregnancy and nursing. It feels well packed like it’s not going to lose support although I only have it a couple of days I can’t say for sure, however at that price I would buy another if it did. It’s making a huge difference to me. Thank you.